THE GEAR: Jersey: FXR Revo, Pants: FXR Revo, Helmet: Scorpion VX-R70, Goggles: EKS Brand GOX, Boots: Alpinestars LE Tech 10. Q: FIRST AND FOREMOST, IS THE 2018 HUSQVARNA TC125 BETTER THAN THE 2017 TC125? A: Yes. The small changes that Husqvarna made to the TC125 for 2018 make it a better all-around race bike; however, if you already own a 2017 TC125 and have spent time and money working on your suspension and jetting, the added cost of stepping up to the new bike would be better spent on new pistons and rings for your old bike. At its core, the 2018 Husqvarna is the 2017 TC125 without the horrible jetting. If, however, you have a 2015 or 2016 TC125, you’ll appreciate the technological leaps that Husky made over the last two years. The 2018 Husqvarna TC125 is only the fourth year that the tiddler has been imported to America. It came into its own in 2017 when it got the WP AER air forks. Q: WHAT IS THE HISTORY OF THE HUSKY TC125 OVER THE LAST FEW MODEL YEARS?A: It would be pointless to go back in time and look at the original Swedish-built, Cagiva-built or BMW-built Husqvarna 125s, so let’s just focus on the period of time when KTM became involved. 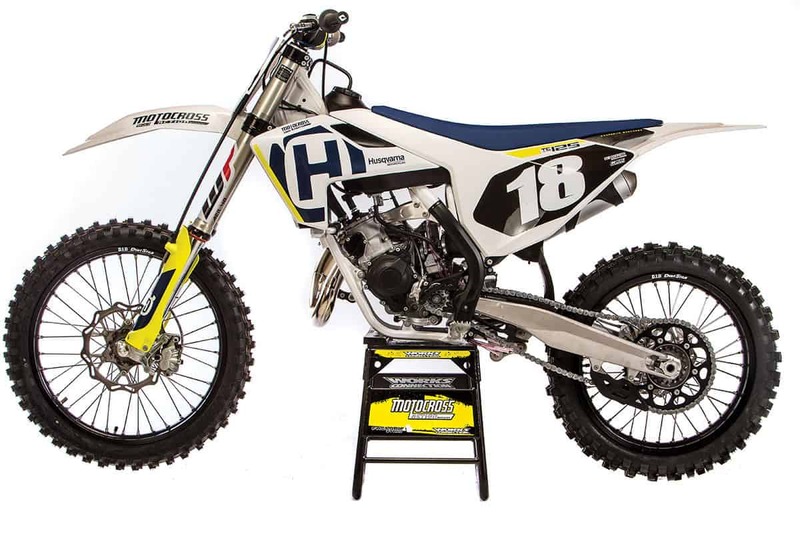 2013: The 2013 model year was the last of the BMW-owned, Italian-built, old-school Husqvarna CR125s. 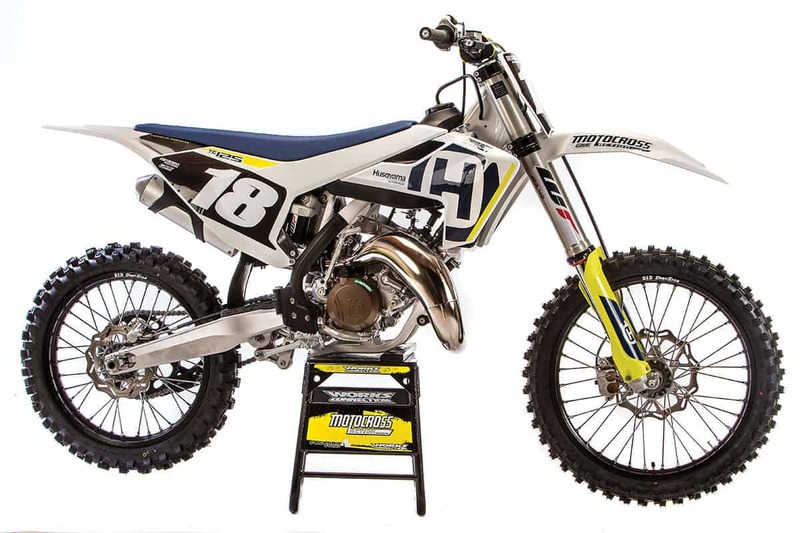 The coolest thing that Husqvarna did in 2013 was to include a complete 144cc top-end kit with each CR125 sold. The 2013 CR125 had a narrow, high-rpm powerband that only a highly skilled sugar freak could keep in the sweet spot. Ridden flat out, it was a fun bike to ride, but ridden half-heartedly, it was frustrating. It was, however, a much better bike with the 144cc top-end installed. Back in 2013, a Husqvarna CR125 cost $6299. 2014: Husqvarna, now owned by KTM and moved to Austria, did not import a TC125 two-stroke or FC350 four-stroke to the USA in 2014. That doesn’t mean that the company didn’t make a 2014 Husqvarna TC125—just that it didn’t import it to the USA. KTM had purchased Husqvarna in late 2013 and didn’t have time to come out with a complete fleet of new models for 2014. So, they just gussied up the existing KTMs in white plastic to get the Husky ball rolling. They decided to focus on the TC250 two-stroke and FC250/FC450 four-strokes for U.S. consumers. 2015: It wasn’t until 2015 that Husqvarna brought the first TC125 to American shores. It was a clone of the 2015 KTM 125SX but with white plastic, a molded airbox/subframe and the slipperiest seat cover ever put on a motocross bike. It shared everything else with the KTM 125SX, including the harsh WP 4CS forks, terrific Brembo brakes and strong hydraulic clutch. It was a good bike if you knew a suspension tuner for the 4CS forks and owned a drill for the airbox. 2016: This was the year of the big change for the Husky. Every piece of the 2015 engine was re-engineered for 2016. The clutch shaft and crankshaft were moved up for a more compact package. Engine weight was reduced by 4 pounds. It had a new cylinder, piston, head, crankshaft and six-speed transmission. The new frame had 20-percent-greater torsional rigidity and 30-percent less longitudinal stiffness. The head angle was steepened by 0.4mm, and the wheelbase was shortened by 10mm. The triple clamps were rubber-mounted, although they still held WP 4CS forks. The 2016 TC125 was a vastly improved bike. But, the 4CS forks and choked-up airbox were both Debbie Downers. 2017: Husky finally dropped the poorly rated 4CS forks for the all-new WP 48mm AER air forks. It was a massive improvement and saved 3 pounds at the same time. Other changes in 2017 included a 10mm-longer brake pedal, revised rear brake pads, Mikuni TMX 38mm carburetor, bridge-style top bar mounts, ODI lock-on grips and Dunlop MX3S tires. The only downside of the 2017 Husqvarna TC125 was the swap from the proven Keihin carb to the unproven Mikuni. There were jetting issues. The retail price was $6999. The left-side panel can be removed without tools to expose the airbox. The seat is held on with one bolt, and the stock muffler is supported by a molded hanger. 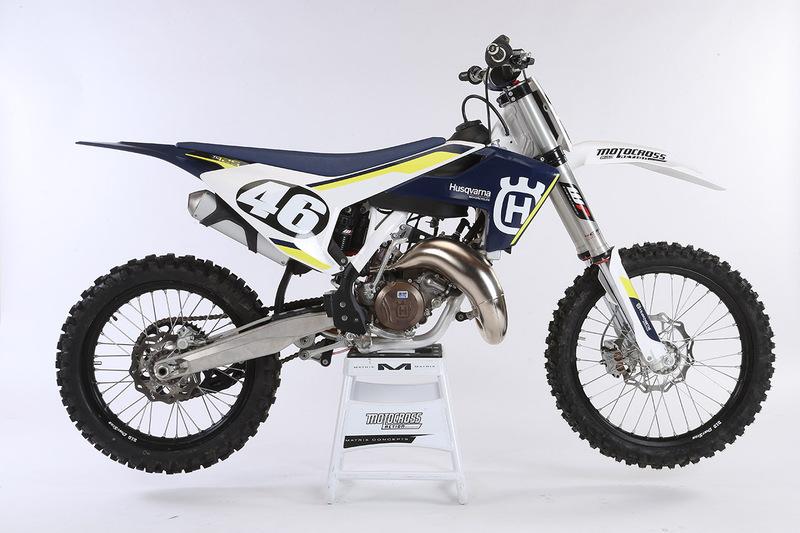 A: Here is a quick list of the modifications that Husqvarna made to the 2018 TC125 two-stroke. (1) Fuel mixture. Last year the Husky engineers told us to run a lean 60:1 fuel/oil mixture. For 2018 the engineers reversed direction and told us to run a much more common 40:1. The brass ensemble has been changed for 2018 with the same 480 main, richer 35 pilot, leaner air-screw setting and a 6BFY42-75 needle instead of last year’s 6BFY43-73. (2) Fork settings. The 2018 WP AER forks have been updated with a new air seal, air piston and rebound spring on the air leg, along with a new piston on the damping side. For 2018 the compression damping has been firmed up in the mid-stroke. Last year’s AER fork had free-bleed around the compression shim stack, which made the damping too light in the mid-stroke, which created a high-speed flutter in consecutive braking bumps. 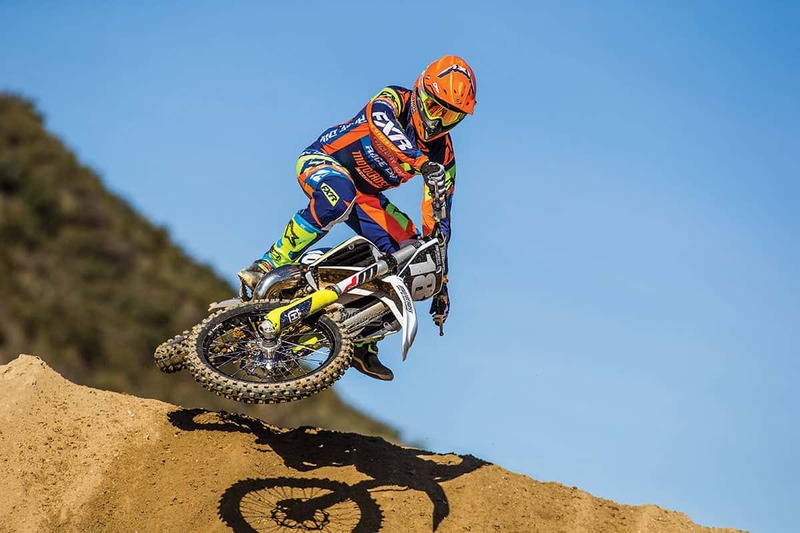 For 2018 Husqvarna’s engineers addressed this issue; however, what they did to the 2018 forks was not rocket science, and any reputable suspension tuner can duplicate the mods. (3) Clutch. 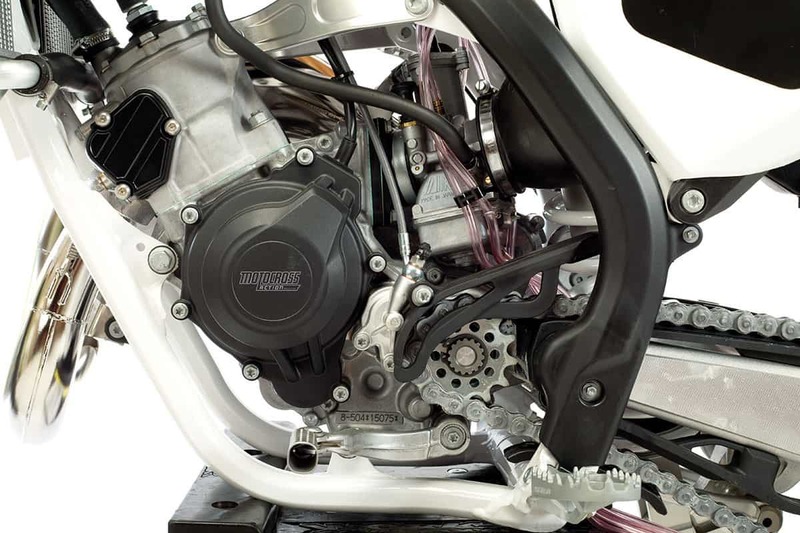 The metal clutch plates have been nitrided, which means they are case-hardened by a heat-treating process that diffuses nitrogen into the surface of a metal. (4) Miscellaneous. The 2018 radiator guards don’t have the shelf that trapped dirt last year, but you can drill out your 2017 shelf or clean your radiator guards between motos to achieve the same thing. A C4 transmission bearing has been installed to increase reliability by virtue of more internal clearance during thermal expansion. For 2018 the shift star is Metal Injection Molded (MIM). In this process, 15-micron metal powder is heated and injected into a mold cavity under high pressure to produce a shift star with closer tolerances than a CNC-machined part. (5) Frame. The frame is exactly the same as in 2017. (6) Shock. The valving has been revised to work with the new fork valving. Q: ARE THE FORK MODS AN IMPROVEMENT ON THE 2018 AER AIR FORKS? A: Yes. The compression damping has been firmed up into the mid-stroke. Last year’s free-bleed around the compression shim stack was the source of considerable flutter in braking bumps and over fast chatter. For 2018 WP put a larger shim (30mm instead of 26mm) against the mid-speed valve to increase low-speed compression by 5 percent and to lessen the high-speed compression by 10 percent. The rebound-damping shim stack remains the same. In a strange move, the fork’s mid-valve, which was constructed from a special ceramic composite material in 2017, was changed back to the previous sintered-steel material. From the earliest prototype version of the WP air fork, the air seal has undergone constant updates. The first version of the AER forks, which were only installed on 2016 European models, had an air seal that could not handle cold temperatures and would leak air pressure from one chamber to the other. WP changed the seal material to a more resilient and less temperature-sensitive compound. Unfortunately, that was not the perfect cure. In 2017, when the AER forks were first introduced in the American market, the lip seal was replaced with a quad-ring seal. The quad-ring solved lots of problems, but because it had four small sealing surfaces instead of one large one, repetitive wear became an issue. For 2018 the WP AER forks switched to a larger air seal to replace the 2017’s quad-ring seal. The new seal has a unique, slightly out-of-square shape that increases surface area for better sealing and longer wear. Husky’s TC125 engine is amazingly compact. They achieved this by stacking the engine shafts vertically. Very trick. 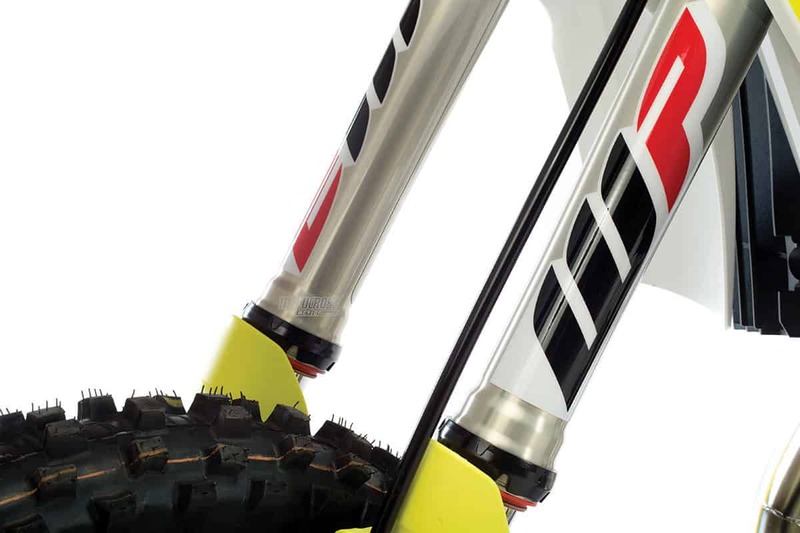 Q: WHAT DO YOU NEED TO KNOW ABOUT THE AER AIR FORKS? A: The 2018 air forks are better than last year’s version. Don’t let the demise of Showa SFF-TAC air forks or Kayaba PSF-2 air forks fool you into thinking that air forks can’t be made to work. 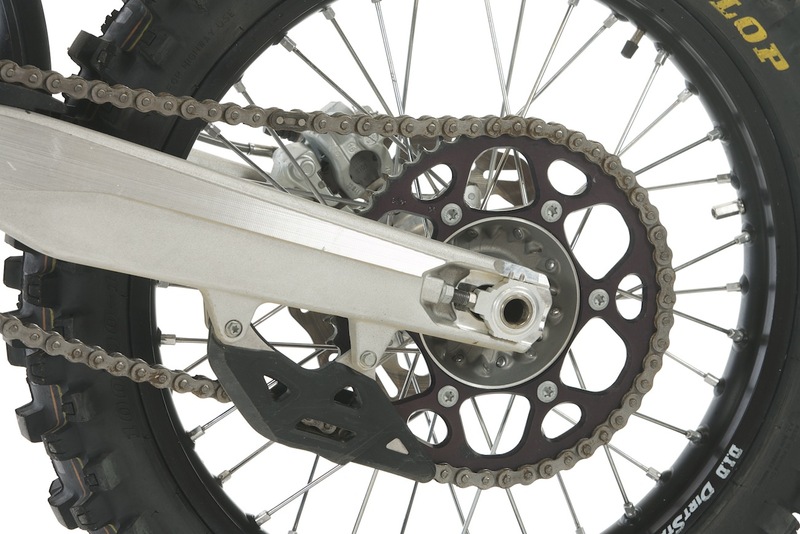 The WP AER air forks avoided Showa’s and Kayaba’s problem areas by simplifying the air fork concept. You don’t have to have a degree in plasma physics to tune the WP air forks. Unlike Showa and Kayaba, who tried to reinvent the wheel, WP designed its forks so the air pressure in the forks does nothing more than replace the coil springs. On the 2018 TC125 forks, we actually hovered around the recommended 124-psi setting—and never ventured too far away. Slower or lighter riders could go down a few pounds, but for the majority of test riders, we actually upped the air pressure a couple of pounds. This helped hold the forks higher in their stroke, which not only made the forks feel more resilient but balanced out the chassis at the same time. We selected each test rider’s optimum air pressure by placing an O-ring (or zip-tie) on the right fork leg. Then we had them ride a few laps with the stock air pressure. When they came in, we looked at how much travel they were using and raised or lowered the air pressure to get them within 1 inch of full travel. From that point on, we relied on the compression clicker to fine-tune the stroke. We went out on the compression until it stroked through too quickly and then went back in a few clicks. We loved that we could just pull over and adjust the compression by hand. The rebound, however, is on the bottom of the fork and is adjusted by a flat-bladed screwdriver. Q: IS THE 2018 HUSKY TC125 FASTER THAN THE POORLY JETTED 2017 MODEL? A: Yes. Thank goodness. It was a nightmare last year trying to sort out the jetting. This year it is in the ballpark. It’s not perfect, but it’s much closer. We went one size richer on the main jet (490) and Husky went two sizes richer on the pilot (35). We still believe that the Mikuni TMX 38mm carburetor is inferior to the Keihin PWK carburetor, which was less temperamental and ran cleaner throughout the range. Although, when we think back a few years, the Keihin had its teething issues too. 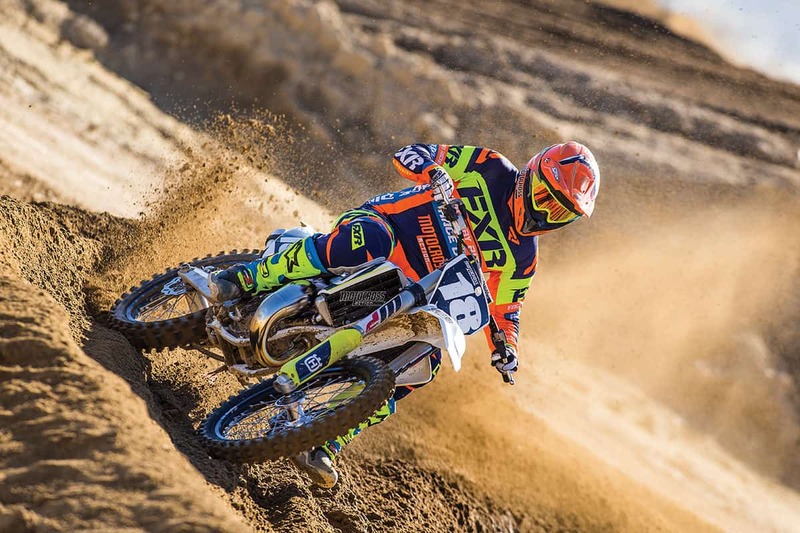 Husqvarna did not switch from Keihin to Mikuni for a performance boost. Although Husky, KTM and Keihin have been mum on why the carbs were changed, we assume that it was a production capability issue at Keihin’s factory or a significant price difference between Keihin and Mikuni, or maybe a little of both. Whatever caused Carb-Gate, we miss the no-hassle Keihin. Getting the most out of your WP AER air forks means following a set regimen that takes less than an hour of test times. If you haven’t ridden a new-age 125cc two-stroke, you will be pleasantly surprised. They have much broader powerbands than in the good old days. Plus, the Husky TC125 has a clutch that can take a boatload of abuse without whimpering. The Husky powerplant pumps out 37 horsepower (great for a bike that only weighs 195 pounds). The power-to-weight ratio is incredible. Numerically, there are not a lot of performance items that make the 2018 TC125 better than the 2017 model, but when you aren’t chasing brass, you can get more out of an engine with less worry. On the negative side, the TC125 takes longer to get to the meat of the powerband compared to the KTM 125SX due to the restrictive plastic airbox design. Once in the power pocket, the engine pulls on top like an Audi into a garage wall with granny at the wheel. But, you can get better Husky power by cutting out the right side of the airbox with a box-cutter and drilling a few holes in the left airbox side panel just behind the air filter. Husqvarna specs a 42 N/m shock spring. It is lighter than an FC250 or FC450 spring, but it works great. Q: HOW DOES THE HUSKY TC125 HANDLE? A: Better than any four-stroke you have ever ridden. Without the rotating inertia of a valve-and-cam engine to deal with or the extra tonnage of the complicated four-stroke engine, you can put the TC125 where you want it. And, if you change your mind about where you want it, you can muscle it to a new line in an instant. The fact that the Husqvarna TC125 weighs 33 pounds less than the 2018 Honda CRF250, 31 pounds less than the RM-Z250, 27 pounds less than the YZ250F, 25 pounds less than the Husky FC250 and 23 pounds less than the KTM 250SXF is what accounts for the little two-stroke’s handling prowess. It’s quick, agile, light and flickable. Q: HOW WAS THE STOCK GEARING? A: Given the effects of the plastic airbox on low-to-mid throttle response, the 2018 Husqvarna TC125 could use a bit more bark to get it out of corners. MXA’s faster test riders could use talent to keep the power in the sweet spot, but mortal men elected to swap the stock 50-tooth rear sprocket for a 51-tooth rear sprocket. It helps jump the power up into its effective range sooner. But even more important, it makes third gear more effective. 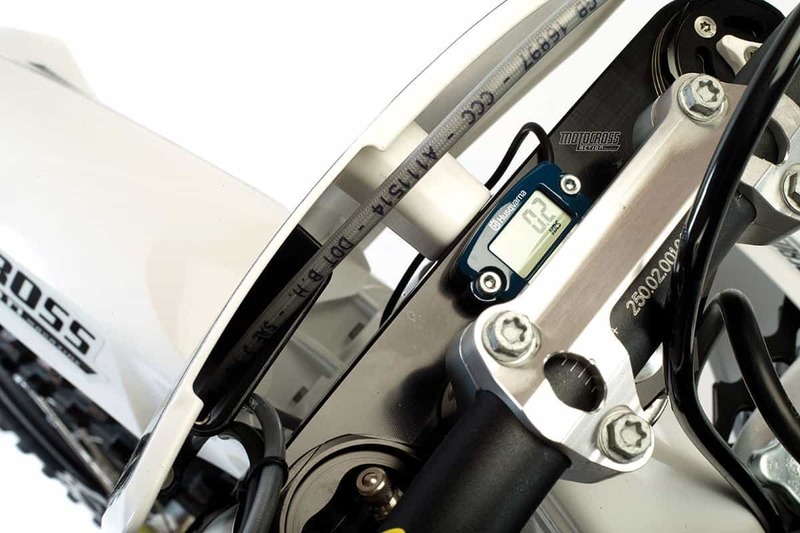 Husqvarna installs an hour meter on every bike at the factory. They don’t stay at 0.2 hours for very long. (1) Spacers. There are spacers in the seat-bolt hole and right-side panel that fall out when you remove either of these two bolts. Shouldered bolts or tolerance-fit spacers would solve this problem. We used grip glue. This issue will be addressed for 2019 at the factory. (2) Sprocket/spokes. Watch the sprocket bolts. They loosen up constantly. The same holds true for the spokes, especially the one next to the rim lock. (3) Front brake hose. Be very careful when hooking tie-downs onto your handlebars that they don’t crimp the L-bend tube coming out of the front brake’s master cylinder. Always use soft-tie straps. (4) Tiny Torx. Although the left-side panel pops off without any tools, the right-side panel requires a #20 Torx wrench or 6mm socket. Plus, you’ll need a #20 to bleed the forks. To make matters worse, the clutch-side ODI lock-on grip can only be removed with a #15 Torx wrench. (5) Gearing. The best all-around fix for Novices and Vets is to gear it down one tooth. (6) Frame guards. Why paint the frame white if you are going to cover the most visible parts with full-length black frame guards? (1) Weight. This bike feels as light as it is. (2) Brakes. They are the best in the class. And since these are the same brakes that come on the heavier Husqvarna FC450, they are even more impressive on the 195-pound TC125. (3) Hydraulic clutch. Husqvarna’s self-adjusting clutch is ahead of its time—or are the Japanese brands way behind the times? (4) Airbox. After years of having to wrestle big filters through small holes, the KTM/Husqvarna air-filter design is a blessing. We don’t think changing an air filter could get any simpler. (5) Engine. This small but mighty engine puts out some serious power. If you want better throttle response, you can get it with a drill. (6) Suspension. The WP suspension components are getting better each year. (7) Tires. The TC125 comes with Dunlop Geomax MX3S tires front and rear. Q: WHAT DO WE REALLY THINK ABOUT THE 2018 HUSQVARNA TC125? A: The best thing about riding a 2018 Husky TC125 is blowing by a bunch of guys on $20,000 450cc four-strokes. This test rider weighs 195 pounds. The Husky TC125 weighs 195 pounds. They are in the same weight class. Guess who wins a wrestling match? This is how we set up our 2018 Husky TC125 for racing. We offer it as a guide to help you find your own sweet spot. Notes: Don’t worry about checking the WP AER fork’s air pressure every time you hit the track. Do, however, bleed both of the air screws on the top of the forks. Notes: The stock shock settings are in the ballpark. The majority of MXA test riders made no adjustments other than sag adjustments for their weight. 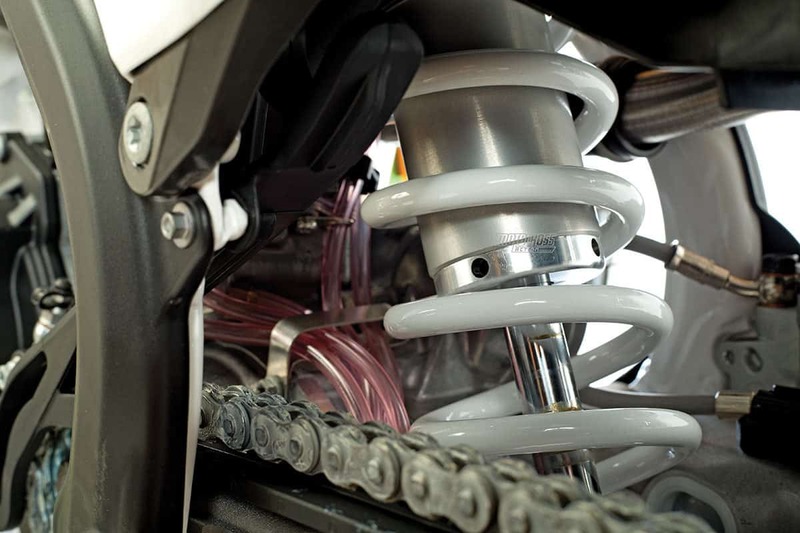 This shock may not be up to Kayaba YZ125 shock standards yet, but it is closing the gap each year. Here’s what we ran in our 38mm TMX (stock settings in parentheses). Notes: The TMX carb can be temperamental at times, but in most cases, an air-screw adjustment is the best place to start ironing it out.